Cleaning out your rain gutters is very easy, as long as you don’t mind being on a ladder and getting a little dirty during the gutter cleaning process! It’s is a home maintenance task and you should clean your gutters a couple of times a year, like Fall and Spring, you will save yourself a lot of time and certainly money if they have to be replaced. You’ll know it’ time for gutter cleaning if you start seeing a waterfall pour off the roof. If your rain gutters are not able to drain properly, and the water has no where else to go, it is likely to start seeping into your walls. 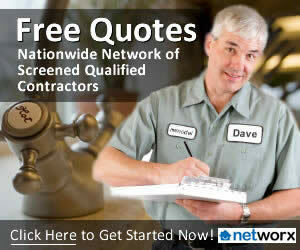 Or, they become very heavy as the debris absorbs the water that can’t flow, and the gutters will start crumbling down! Decide where to Start: You can really start your gutter cleaning anywhere, but the corners of your home would be ideal because that is where the rain gutter downspouts are usually located. Starting at a downspout and working away from it will avoid more debris from falling into it. Remove Debris: Make sure you have your gloves on. You want to make sure you are protected in case there is anything sharp in the gutters. Start the gutter cleaning by scooping out large debris with a garden trowel or with your hands. Be gentle when removing clogs because rain gutter are not that strong. They can be bent and damaged very easily. Inspect the Rain Gutters: As you are gutter cleaning, make sure you inspect your downspouts and rain gutters for any sort of damage. You will want to look for holes, cracks or dents and if there is any damage, you’ll want to get these fixed as soon as possible. You might also consider covering your rain gutters with a wire or plastic mesh to cut down on debris. There are variety of protectors are on the market that will deflect the leaves and other debris from the gutters. If you do decide to install one, be sure that you purchase a model that can easily be removed to allow for your biannual gutter cleaning chore. Flush out with water: After you are finished cleaning the debris and any clogs, you will want to use your garden hose to flush it all out. Again, be gentle when flushing with water. At this point the water should be flowing easily since all the debris is gone. Never hold on to the gutter or downspout for support because they are not meant to support your weight. For more Tips, please visit the Lawn & Garden Section of our website. 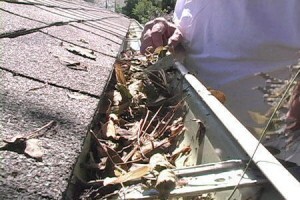 Do you have any tips to add about Gutter Cleaning? Great article about rainwater drainage systems maintenance. Keep on the good job !